Scottish Conservative leader Ruth Davidson. 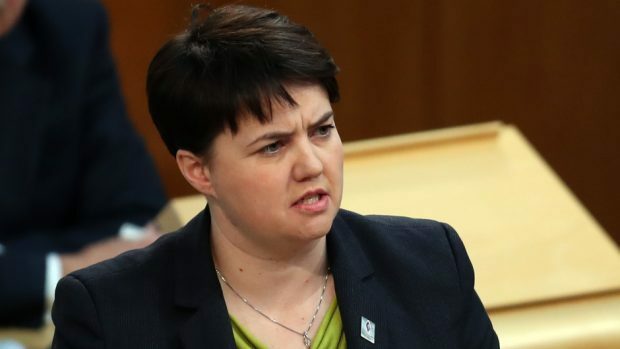 Terrorists are afraid of strong women, Scottish Conservative leader Ruth Davidson said as she paid tribute to those killed in the Manchester attack. “I saw that concert in Manchester and I thought what a fantastic response from Britain to those people who want to silence us,” she said. “Who don’t want strong women, who don’t want strong women on a stage at a pop concert, who don’t want strong women running for government, who don’t want strong women anywhere in Britain. Ms Davidson was speaking at a removal company warehouse in Edinburgh to introduce prime minister Theresa May on her last campaign visit to Scotland. Ms Davidson said voters should back the prime minister to send a message to the first minister over a second independence referendum. But the prime minister came under fire for VAT charges costing Police Scotland £35million a year under questioning from journalists after her speech. SNP deputy leader Angus Robertson said Ms May had been caught bang to rights when she tried to laugh off the question and suggested people look to the Scottish Government’s record. He said: “The Prime Minister was clearly unaware that thanks to her government, Police Scotland is the only territorial force in the UK to be charged VAT. This was a shambolic performance from a clueless Prime Minister. “The Tory position on VAT is an indefensible decision which has short-changed Police Scotland of tens of millions of pounds – and Theresa May is bang to rights.